A Natural Traveler makes any kind of Travel easy! It is designed to dry the shampoo bar between uses and transport it with out spilling in your luggage or backpack. Our shampoo is renowned for its superior Multi-Tasking abilities. First and foremost it is designed for your hair, so it will give you healthy, beautiful, clean hair naturally. Most people don't need a conditioner, there are no harmful detergents to strip all the natural oils from your hair. It also works as a very mild body soap - for shaving - and it loves clothing. Wash your socks, undergarments etc. safely and easily at night and wear them the next day. By Multi-Tasking ...it saves you space, ...replaces many other carry on items, and it's "Airline Friendly". Our shampoo uses very little water because it rinses so quickly and easily! Along with a full 3.5 oz bar of shampoo we include a convenient Free face cloth (see front of package), and a unique "Bar Saver" pictured to the right. It is designed to be attached with water to the bottom of the bar. It stays attached to the bar until the shampoo is used up, then you simply attach the next bar in the same manner. Easy! The patented "Bar Saver" keeps the shampoo from sticking to surfaces and won't pick up debris if you are camping or backpacking. The inside is designed both for air flow (to dry the bar), and for easy removal. 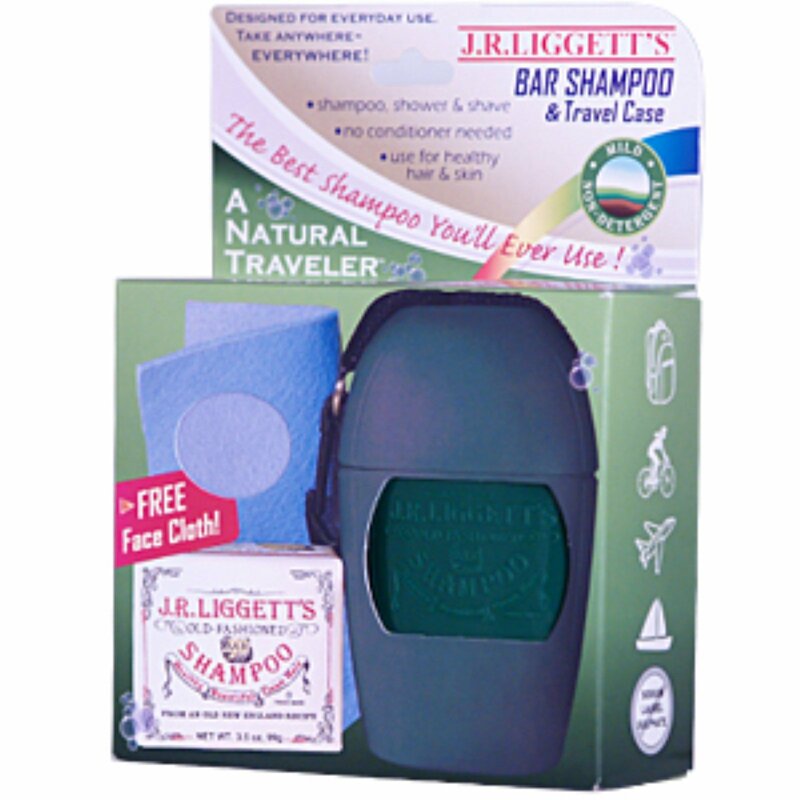 J. R. Liggett's bar shampoo is excellent for anyone with allergies, dermatological issues, or extremely sensitive skin. If the bar is allowed to dry between uses it equals approximately a 24 oz, bottle of liquid shampoo. Each bar equals approx. a 24 oz bottle of liquid shampoo! Olive Oil, Coconut Oil, Castor Oil, Fresh New Hampshire Spring Water, Sodium Hydroxide (a binder) and Essential Oils for Fragrance. One 3.5 oz Bar of Original Formula Shampoo and One Patented Natural Traveler that includes One Bar Saver, and One Free Camp Towel Face Cloth.